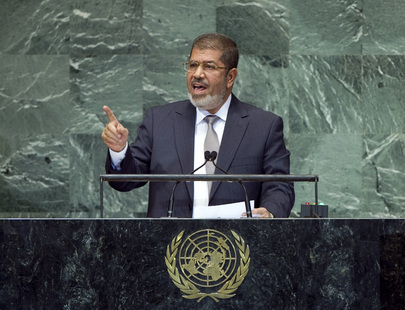 MOHAMED MORSY, President of Egypt, told Member States that he was the first Egyptian civilian President elected democratically and freely following a great revolution in his country. Since that revolution, Egyptians had taken a number of steps towards establishing the modern State to which they aspired — one that was in tune with the present, based on the rule of law, democracy and respect for human rights; a State that sought justice, truth, freedom, dignity and social justice. “The Egyptian revolution was not the product of a fleeting moment, or a brief uprising,” he said, adding, “nor was it the product of the winds of change of spring or autumn.” Rather, the revolution, and all the ones preceding and following it throughout the region, was triggered by the long struggle of authentic national movements that sought a life of pride and dignity for all citizens. That vision of a new Egypt should also guide the country’s cooperation with the international community, he said, in a spirit of equality and mutual respect and entailing the non-intervention in the affairs of other States. The “new Egypt” was determined to regain its standing among nations, assume an effective role in global issues. Egypt’s involvement in Arab, Islamic and African issues was the reflection of the essential role it played in defence of interconnected fates and interlinked interests and values. In that vein, long decades had passed since the Palestinian people expressed their longing for their full rights and for building their independent State, with Jerusalem as its capital. It was shameful that the free world accepted, regardless of the justifications provided, that a member of the international community continued to deny the rights of a nation that had been longing for decades for independence. It was also disgraceful that settlement activities continued in the territories of those people, along with the delay in implementing the decisions of international legitimacy. He called, in that regard, for the immediate and significant measures to put an end to colonization, settlement activities, and the alteration in the identity of Occupied Jerusalem. The bloodshed in Syria and the humanitarian crisis that had unfolded there “must be stopped”, he continued, as the Syrian people deserved hope for a future of freedom and dignity. That was the essence of the initiative he had proposed last month in Mecca, along with three other nations; they would continue to work to put an end to the suffering of the Syrian people and provide them an opportunity to choose freely the regime that best represented them. He also emphasized that the initiative was open to all those who wished to positively contribute to resolving the Syrian crisis. Indeed, Egypt was committed to putting an end to the catastrophe in Syria within an Arab, regional and international framework. That should spare Syria to dangers of foreign military intervention, which he opposed. Egypt was also committed to supporting the mission of Lakhdar Brahimi, the Joint Special Representative of the United Nations and the League of Arab States, and continuing the current efforts aiming at unifying the Syrian opposition and encouraging it to propose a comprehensive, unified vision of the steady, democratic transfer of power. Turning to the situation in Sudan, he urged Member States to support that country. Sudan had committed itself to a Comprehensive Peace Agreement and it had been the first country to recognize the nascent State of South Sudan. “But let me be frank: it has not received the support it deserves”. Similarly, he called upon Members of the Assembly to support the Somali people in their present difficult period of transition, and in fending off those seeking to hinder their efforts to achieve stability, reconstruct public institutions, and realize the aspiration of the Somali people for a better future. Over many years, some had wrongfully sought to attain stability through oppression and tyranny, he said. “Some of us have, alas, applauded their bad deeds”. But now that the peoples of the region had regained their freedom, they would not tolerate being deprived of their rights, whether by their own leaders or outside forces. The will of the people, in particular in the region, no longer tolerated the continued non-accession of any country to the Nuclear Non-Proliferation Treaty and the non-application of a safeguards regime to their nuclear facilities, especially if that was coupled with irresponsible policies or arbitrary threats. In that regard, the acceptance by the international community of the principle of “pre-emptiveness” or the attempt to legitimize it was, in itself, a serious matter and must be firmly confronted in order to avoid the prevalence of the “law of the jungle”. In that regard, Egypt stressed the need to mobilize international efforts to hold a conference on achieving a Middle East free of nuclear weapons and all other weapons of mass destruction before the end of the current year. “The only solution is to get rid of nuclear weapons”, he said. The world also had a responsibility to support Africa’s efforts at development and economic growth, beyond mere promises. Egyptians, as Africans, were ready and willing to do so. In addition, the youth representing the majority of the country believed that real legitimacy was derived from the people’s will, not the one imposed by an assertive authority that lacked any legal or moral basis. In that vein, he recalled that he had proposed, during the Non-Aligned Movement summit in Tehran, a new initiative dedicated to youth issues and paying particular attention to the issues of education, training, employment and improving their participation in political life. In addition, “we look to the current situation in the international financial system, and stress the need to work diligently to reform it.” Revitalizing the General Assembly and reforming the Security Council must also remain high on the priority list of issues that must be tackled with the necessary seriousness.